The month’s sharpest science shots — selected by Nature’s photo team. Good vibrations. 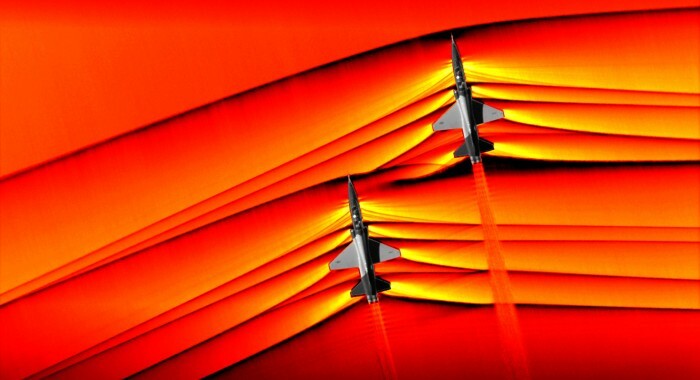 This false-colour image shows shockwaves emanating from supersonic US T-38 Talon aircraft, used to train fighter pilots. During the flights, at NASA’s Armstrong Flight Research Center in Edwards, California, space-agency staff tested a system that captured high-quality images of the shockwaves. These rapid changes in air pressure cause people to hear ‘sonic booms’ on the ground. The data from the imaging system will help aeronautical engineers to design a ‘quiet’ supersonic craft. Out on the asteroid. It’s been a busy few months for Japan’s asteroid craft Hayabusa2. The probe, which is hanging out by a space rock called Ryugu, touched down on the body in late February, and collected some space dirt that was kicked up after the craft fired a bullet at the surface (pictured). On 5 April, it performed its most daring manoeuvre yet: it dropped an explosive on the surface to create a small crater that will expose some subsurface layers. Hayabusa2 will gather further material during a later touchdown, and, eventually, return the samples to Earth. Jungle dangers. 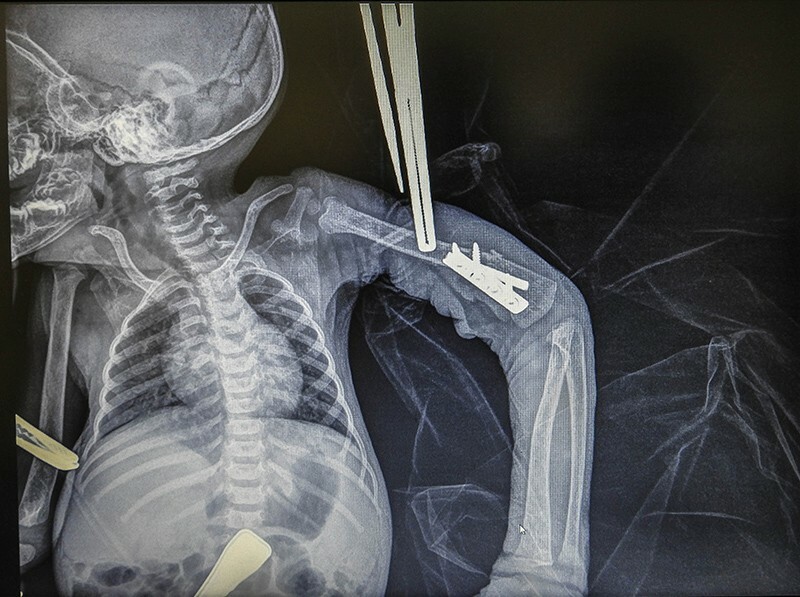 This X-ray image shows a three-month-old baby orangutan having surgery on a broken arm in North Sumatra, Indonesia, where tropical rainforests are threatened by palm-oil plantations. The ape had surgery at the Sumatran Orangutan Conservation Programme’s rehabilitation centre in North Sumatra. Brenda was rescued days after rescue workers found an adult orangutan named Hope in the area with 74 air-rifle shots in her body; the animal was blinded as a result. ﻿Conservationists warn that orangutans are likely to become the first great apes to become extinct in the wild. Glassy-eyed. 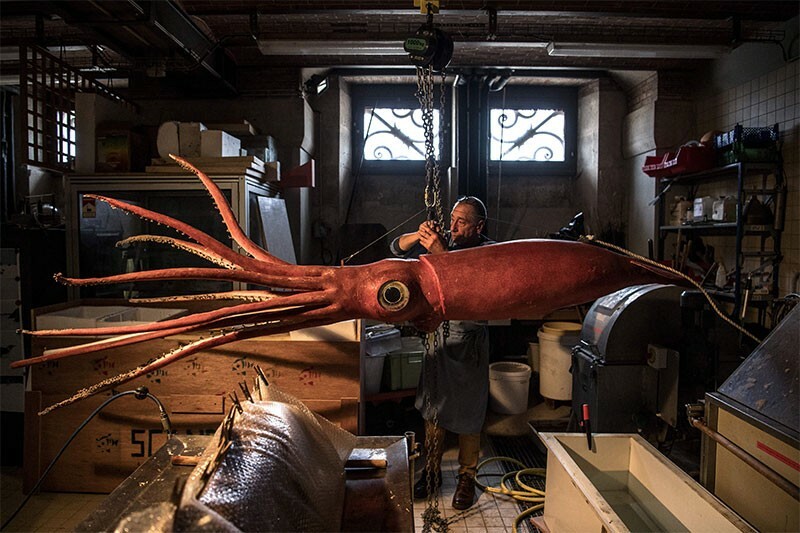 Head taxidermist Christophe Gottini, at the French National Museum of Natural History in Paris, gets to work restoring a giant squid for an exhibition on the ocean. CSI: Charcoal. This image looks innocent enough, but it could help to fight rising tree fraud. 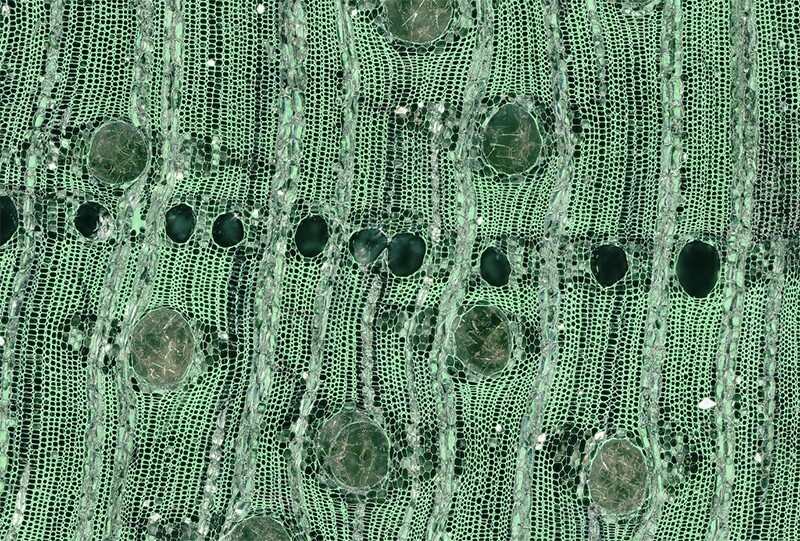 The micrograph shows a section of charcoal made from a tropical Fabaceae tree from Africa; it was captured using a technique developed by Gerald Koch and Volker Haag at the Thünen Centre of Competence on the Origin of Timber in Hamburg, Germany. The method is one of a growing arsenal of tools that scientists are using to detect illegally logged and exported trees. In 2017, Koch helped to expose a scandal in which many Germans were burning charcoal that had been made from protected forest wood. In thunder, lightning, or in rain? 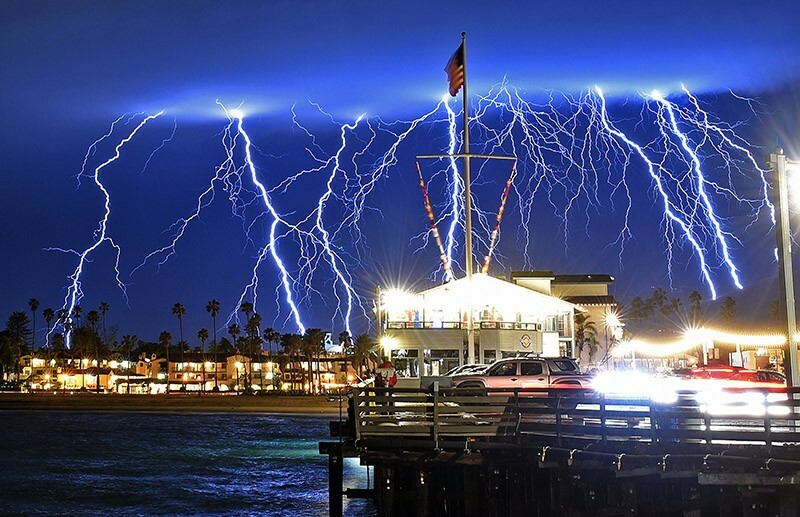 This spectacular light show was captured in Santa Barbara, California, with a long exposure. The electric display﻿ came during winter storms that brought heavy rain, hail, thunder and lightning to southern California in early March. Moon games. 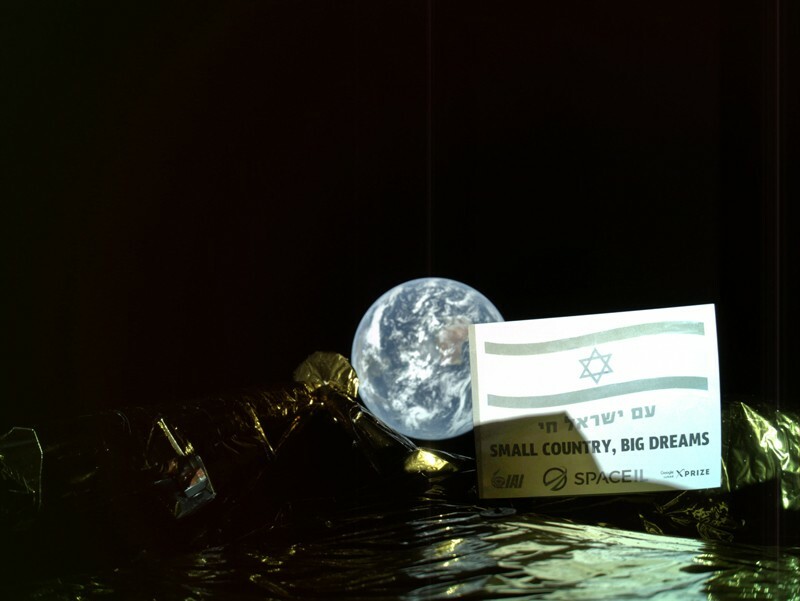 ﻿Israeli lunar spacecraft Beresheet is on track to become the first privately funded probe to land on the ﻿Moon. The craft, which also has the backing of Israel’s space agency and launched in February, has now made the leap from Earth orbit to lunar orbit and is scheduled to land on the Moon on 11 April. Beresheet’s success and renewed government interest in Earth’s rocky companion seem likely to herald a new lunar space race.